Medical students hit the kitchen for a ‘dose’ of healthy eating education! As you’ve heard me say before, making good choices in what we eat is so important! Whether you have a dietary restriction or whether you just want to avoid future medical issues, what you eat is huge! I actually have this sign ‘framed’ and display it at my home tasting parties and workshops, and it usually gets a chuckle from my customers! But laughs or not, it’s true! 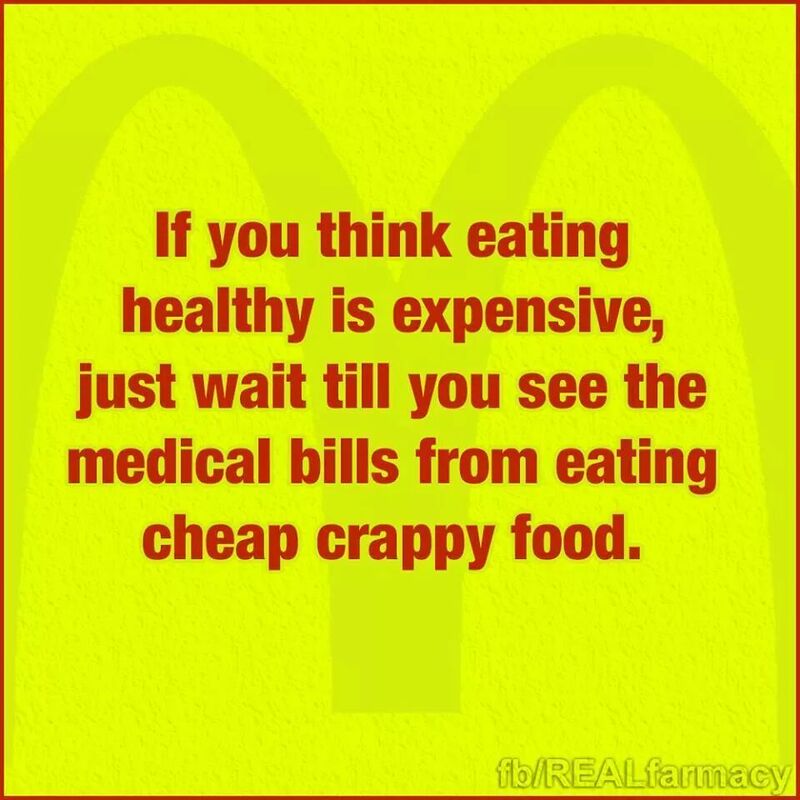 Believe it or not, healthy eating and nutrition is NOT something that is taught in medical school, although the results of poor choices raise the number of visits to the doctor’s offices! When it comes to premature death and disease, what we eat ranks as the single most important factor, according to a study in the Journal of the American Medical Association. Yet few doctors say they feel properly trained to dispense dietary advice. One group, at least, is trying to fill that knowledge gap. Most medical schools nationwide don’t offer hands-on nutrition training. In fact, only about a quarter of American med schools offer the 25 hours of nutrition training recommended — but not required — by the National Academy of Sciences. That’s why the following concept got my attention when I read about it recently. Seems that a dozen University of Chicago first year medical students went to one of the area’s top cooking schools to take a culinary nutrition class they won’t even get credit for. The class is being taught at night, after hours, by Dr. Sonia Oyola and Dr. Geeta Maker-Clark. Maker-Clark did study culinary medicine. But not at med school. “This training was something that I pursued on my own after I graduated from residency,” Maker-Clark says. “I really received none of that kind of nutritional information during medical school.” So this spring, she and her colleagues launched a pilot based on a culinary medicine course taught at Tulane University. There, med students are required to take it. The four-week culinary nutrition class in Chicago starts with about an hour on diet-related disease and how to treat it with food, followed by a healthy dose of hands-on cooking. Studies show this kind of personal experience makes doctors much more likely to pass along health and nutrition information to their patients. But no medical board requires doctors to study it. A few years ago, Devries left his cardiology practice to lead the Gaples Institute, aimed at expanding nutrition training in medicine. This summer he’s launching an online nutrition course for doctors. But he also wants to reach students. So he recently met with fellow nutrition advocates who want to add nutrition questions to medical board exams, change accreditation standards and tie medical training grants to nutrition education. For now, this class is just a small, grant-funded pilot, but Dr. Maker-Clark envisions a day when it’s standard fare at all American med schools. So when you feel lousy, and your lab tests are all over the map, and you pop prescription pill after prescription pill to combat your high blood pressure, your high cholesterol, your diabetes, ADHD, Chrone’s Disease, Ulcers, and so forth, remember that chances are your doctor did not study nutrition and healthy cooking in medical school! Give healthy eating and meal planning a try, and see if perhaps you can cut down on the list of ailments and the size of your pill box! You never know! Numerous articles are geared to the premise that processed food makes us overweight by addicting us to fat, sugar, and salt, contributing to the obesity crisis. Michael Pollan, author of “In Defense of Food,” talks about big food companies, saying “The food they’re cooking is making people sick.” He advocates replacing “Big Food’s engineered edible evil” with fresh, unprocessed, local real food. In concept, it makes perfect sense. But what some don’t realize is that this ‘real food’ can be fattening too if you don’t pay attention. Let’s check out a couple of ‘healthy’ product offerings at Whole Foods and Trader Joes. Vegan Cheesy Salad Booster, from Living Intentions, says that the ingredients such as sea vegetables are raw (not processed) with no GMOs. Unfortunately, it has three times more fat per ounce than a Big Mac and four times the sodium. Inner Peas is a snack food (also by Living Intentions) containing peas breaded in cornmeal and rice flour, fried in sunflower oil and sprinkled with salt. Unfortunately, the fat outweighs the protein by 6 times, plus there are far too many carbs to be considered a healthy snack. Inner Peas are 455 calories per serving for $1.49 while McDonald’s medium fries are 380 calories for $1.49. Research shows that trimming calories in a meal by as much as 30% can be done without really noticing the change. Reducing a portion size and swapping out a few ingredients for higher fiber ones can (over time) help tip the scales in your favor. Sadly, price contributes to the obesity problems. A bag of potato chips (160 calories) is $3.50 while a box of kale chips (130 calories) is $8.00. Average Americans still get 11% or more of their calories from fast food. Fast food became popular because it was tasty, convenient, and cheap, creating an ‘obese poor.’ But now, in response to vocal critics and the loss of increasingly health-conscious consumers, some fast food chains such as McDonalds have been slowly making healthy changes in their menus without a lot of fanfare. For example, did you know they’ve been substituting whole grain flour for refined flour in the Egg McMuffin? They dropped the Angus third-pounders and added a new line of quarter pound burgers on whole grain buns. They added an egg white wrap. They’ve reduced portion sizes, reduced fat and salt content by more than 10%, and added fruits, vegetables, low fat dairy, and oatmeal. Burger King added a turkey burger to their line. Why aren’t you hearing this in their ads? Because their marketing people know that the fastest way to turn off eager eaters is to tell them something on their plate is ‘good for them!’ Is trimming 50 or 100 calories off their favorite fast food staples converting it to ‘healthy’ status? Of course not, but it’s a step in the right direction, and it may help a consumer eliminate a few hundred calories from their diet. And it shows that the foodies’ movement to push Big Food to offer healthier choices IS working and they ARE listening. So keep it up! In short, food processing in and of itself does not make food unhealthy. It’s the INGREDIENTS and the AMOUNT of those ingredients. that do. Keep reading your labels – look at the calories, sodium, the fat, the carbs, and the sugar no matter how many ‘healthy’ claims may be on the front of the box! How old is “too old?” when it comes to food? Because Wildtree products have no preservatives and chemicals, I am frequently asked how long they last. This invariably leads to a discussion about freshness and ‘best by’ dates as well as how spices don’t necessarily go bad, although the flavors can fade with time (so the garlic may be less garlicky, and the jalapeno have less of a bite, etc). One thing I point out to customers is that most spice jars on the store shelves do NOT have expiration dates (or even production dates) on them, so we honestly don’t know if that store bottle of Garlic Powder on the shelf has been sitting there for 2 weeks or 20 years. With Wildtree, because we produce our own products in small batches, we know it’s ultra fresh. AND, we put ‘best by’ dates on our jars and bottles. That makes me feel good! But what about when it’s NOT Wildtree? What do ‘best by’ dates really mean? And what about those products in our pantry that we bought at the grocery store weeks, months, or years ago, that don’t have dates? Research tells us that food marked with dates is more so that products can be eaten in their ‘prime,’ with taste more of a factor than health. But what about those of us who want taste AND health? When is it no longer safe to eat? **According to “Still Tasty,” (a shelf life guide), eggs can be safely eaten past the expiration date, as they typically last 3-5 weeks beyond purchase. And they are safe to freeze if you want to keep them longer. **Tomato sauce (unopened) can last up to a year past its stamped date. If opened, it should be refrigerated for a maximum of 10 days. However, if you see mold, throw the entire jar away. **Don’t keep opened canned goods in the fridge. Store them in a food safe storage container OTHER than the tin can, as the acidic content of the products (such as tomatoes, fruit juice, etc) can transfer the metal into the food and it will have a metallic taste. High tin concentration can cause fever, nausea, and diarrhea. **Harvard School of Public Health showed that consuming canned soup over 5 days increased the concentration of toxic BPA in the lining of the cans. This reportedly can cause disruptions in the endocrine system such as weight gain and liver damage. **Leftovers should not be stored in the fridge (per FoodSafety.gov) longer than 4 days to prevent food-bourne illnesses. Longer storage can put you at risk for food poisoning (including upset stomach, vomiting, and diarrhea). **Perishable food that has been left at room temperature for over 2 hours may begin to grow bacteria and is no longer safe to eat. So be careful of leaving that party buffet of dips and munchies set up for hours so that ‘people can continue to pick at it.’ If you leave your doggie bag from the restaurant in the car while you go to the movies or leave your leftover lunch bag on your desk until you leave work at 5, it’s better to toss it, because the food is no longer safe to eat. **Food exposed to temperatures higher than 90 degrees (such as an outdoor cookout) lasts less than an hour! So eat quickly, and don’t leave extras out for the latecomers- refrigerate them promptly and reheat them later if need be. Speaking of food going bad….what’s the true scoop on mold? We hear it said that mold is what created penicillin, and that cheese is created by a form of mold, so logcally, cutting off a little corner of food that is mildewed must be ok. NOT SO! Mold penetrates DEEP below the surface, especially on soft items like fruits and veggies. There are ‘root threads’ inside which spreads the poisons where you can’t see them, so it is best to be safe and throw the entire item away. Mold spores can even be spread by air circulation systems in the refrigerator (and I know we all hate to clean the refrigerator), but you might want to weed through those mystery packages in the fridge sooner rather than later! If you wait until you have to chase down that funny smell, your family may already be breathing in mold every time you open the door. So, rule of thumb….keep it fresh, and keep it safe! Banned in Boston? Not yet! Banned in Boston” was a phrase employed from the late 19th century through the mid-20th century to describe a literary work, motion picture, or play prohibited from distribution or exhibition in Boston, Massachusetts. During this period, Boston officials had wide authority to ban works featuring “objectionable” content. Today’s post pertains not to plays, literature, or film, but FOOD! Dr. Jayson Calton’s new book “Rich Food, Poor Food” gives a new meaning to the term FOOD POISONING. The following 8 items were on the original list in this book of ‘banned’ foods in other countries, that still have the green light in the United States. 1. Artificial Food Dyes (adds pretty colors while inhibiting nerve cell development). Found in mixes, drinks, candy, mac & cheese, and just about everything. Most dyes are derived from chemicals found in petroleum, which also makes gasoline, diesel fuel, asphalt, and tar. Artificial dyes have been linked to brain cancer, nerve-cell deteriation, and hyperactivity. These are BANNED in Norway, Finland, Austria, France, and the United Kingdom. 2. Olestra (a/k/a Olean) (lowers calorie counts, but causes vitamin depletion). Found in fat-free chips and fries. Created by Proctor & Gamble to substitute for cooking oil, Olestra is reported to rob the body of the ability to absorb vitamins. Side effects can be cramps and bowel problems. It is banned in the United Kingdom and Canada. It is even written up in “50 Worst Inventions” by Time Magazine. 3. Brominated Vegetable Oil (Helps food dyes to stick, but may cause birth defects and organ damage). This ingredient is frequently found in sports drinks and citrus flavored beverages (such as Mountain Dew). Bromine is a chemical that was commonly used to make carpeting flame-retardant, which makes one pause at the idea of ingesting it! Brominated Vegetable Oil (BVO) has been linked to major organ system damage, birth defects, growth problems, schizophrenia, and hearing loss. It is banned in OVER 100 COUNTRIES! Check out Web MD’s Q&A on this oil. 5. Azodicarbonamide (Bleaches flour, but induces asthma). This gem can be found in frozen dinners, boxed pasta mixes, and packaged baked goods. Ironically (and rather disturbingly) this same chemical is used to bleach flour, while also bleaching PLASTIC FOAM (such as yoga mats, and sneaker soles). Azodicarbonamide is known to induce asthma in sensitive individuals. It is already banned in Austrailia, the United Kingdom, and most European countries. 6. BHA/BHT (Preservatives linked to cancer tumors). Found in cereal, mixed nuts, gum, butter, meat, and dehydrated potatoes, BHA & BHT are used to keep food from becoming rancid, but have also been shown to cause cancer in rats. Are we next? This substance is currently banned in England, Japan, and many other European Countries. Berkley Wellness lists these preservatives in their ‘two preservatives to avoid’ article. 7. Synthetic Growth Hormones (Increase profit, but linked to tumor development in humans). Commonly found in milk and dairy products, synthetic growth hormones rBGH and rBST potentially cause infertility, weakened muscle growth, and a wide array of cancers in both cows and humans. It is currently banned in Australia, New Zealand, Canada, the European Union, and Japan. The American Cancer Society has more information on these hormones on their website. 8. Arsenic (Simply put, it slowly kills you!) Think back to the classic play, “Arsenic and Old Lace” or the storylines about the ‘almost undetectable’ arsenic poisioning on TV crime shows, and just about everyone knows that Arsenic can kill you. However, it is still used in chicken feed to make the meat appear pink and fresh. And if it’s FED to the chickens, it is potentially being being fed to YOU in the poultry you eat. It’s banned in the European Union, but not yet in the USA! In the ‘old days,’ the term “Banned in Boston” would elicit laughs from other cities and states who were more liberal in their thinking than Puritanical Boston (who banned works of Hemmingway, Faulkner, Whitman, and countless other authors, and even the song “Wake up Little Susie” by the Everly Brothers in 1957 made the ‘no’ list there!) Through the years Boston became more liberal in the literary sense, and while they became less concerned with our minds in terms of what we saw, heard or read, they also have joined the rest of the US in being very liberal on what we can put into our bodies, even though Boston is known as a medical ‘go to’ for places like Mass General Hospital, Joslin Diabetes Center, Mass Eye & Ear, Childrens Hospital, and Dana Farber Cancer Institute. Therefore, in Boston, “NO food service establishment, vending machine, or mobile food vendor shall store, prepare, distribute, hold for service, or serve any food or beverage containing any artificial trans fat in the City of Boston.” But of course, “These prohibitions shall not include the sale of any food or beverage containing artificial trans fat that is in a manufacturer’s original sealed package and is required by federal or state law to have nutrition labeling.” So, if you want your margerine, partially hydrogenated vegetable oil, or vegetable shortning, you CAN get it on Boston store shelves, but it is not not cooked with by a restaurant, cafeteria, street vendor, etc. One step forward, two steps back? “Banned in Boston” was flawed in the 18th/19th century, and in some ways apparently has not improved in the level playing field of ‘protecting’ its citizens (and YES I live in Massachusetts). But, although the 8 items on this “banned in other countries” list are not Banned in Boston, they are clearly not banned ANYWHERE in the United States. It’s up to you to decide…will they be banned in YOUR kitchen? They are in mine! Celebrities frequently hit the news for their food choices (or what they are giving up), particularly relative to dairy and wheat. And a trend begins. But is it the right choice for those who don’t have allergy issues? A survey by the British Nutrition Foundation shows that one in five now claims to have a food intolerance or allergy, mainly to dairy or wheat. But the vast majority of people are misdiagnosed. In fact doctors believe food intolerance affects no more than five to eight per cent of children and one to two per cent of adults. Food intolerance is the general term used to describe a range of adverse responses to food, including food allergy. So in fact, correctly diagnosed food allergy is even more rare, affecting just one to two per cent of children and less than one per cent of adults. The trend for no or low carb diets is only adding to the phenomenon. Figures from the Flour Advisory Bureau claim that forty per cent of women have eliminated certain foods from their diets in the past five years. But nutritionists claim people who give up one or more food group could be seriously damaging their health unless they replace the nutrients from these food groups. I track my progess of food, water, and movement with the ‘my fitness pal’ app, and strive for the 1200 net calories recommended by my bariatric nutritionist, although sometimes I find that it’s tough to get over 1000. But it keeps me accountable and cognizant to make everything that passes my lips counts! What I’ve been taught through this 7 month journey is that ‘depriving’ causes cravings, and that makes frustrated people fall off the diet wagon, or makes them ‘binge’ when they reach their goal, only to start the entire “gain weight/go on a diet/lose a few pounds/return to the old habits/gain it back/go on another diet” cycle all over again. I was one of those cyclists, and the feelings of frustration, self-loathing, and failure were always there on some level. For me, my cooking is still 100% natural, low sodium, yet flavorful. I still believe in eliminating processed foods, preservatives, MSG, dyes, and such. So, my pantry of Wildtree natural & organic sauces, spices, mixes, and seasonings are saving my life – both literally and figuratively. I haven’t touched my inhaler in 7 months (and I used to need it to walk across the room or up the stairs), my sleep apnea is gone, my blood pressure meds are cut in half. My hiatal hernia was surgically repaired, so my daily Nexium has been eliminated (along with the 3 pillows I needed to fight the daily pain of acid reflux). My cholesterol is still (as my cardiologist put it) ‘lower than he’s ever seen of people who aren’t on medication’. My knee and back problems are on the back burner–the aches and pains a memory that I don’t miss, and 8 bags of oversized clothing have gone to good will. And hopefully, I will have forever avoided the path of diabetes that plagues 98% of my family members. Which was my primary goal in beginning this journey. I still have a ways to go to reach my weight goal, and from there, maintenance will be a life long continuation of these same patterns which have now become comfortable habits. I’m not ‘on’ a diet, nor will I ever ‘diet’ again. I have made lifetime behavior and intake modifications to better my life, and in essence, to SAVE my life. To book your home or virtual tasting party or freezer meal workshop, overhaul your pantry, attend a class in food label deciphering, host a fundraiser, or get some new recipe ideas, etc., visit my website at www.Lauren.MyWildtree.com. Or join me in earning extra income by promoting healthy eating and helping others at the same time! I was invited recently by one of my customers to attend a presentation by two moms– one a Certified Holistic Health coach and the other a Health Educator. Their mission was to share tips on healthy lunches for kids. A pediatrician who opened the presentation, sadly said that he no longer uses the words “overweight,” but instead refers to his ‘chubby patients’ as “pre-diabetic.” He then pulls out his prescription pad and writes “eat more real food” on it and gives it to the parents, explaining that ‘real food’ means something that doesn’t come out of a box or bag. Ironically, I then stumbled across an article rating the ‘kids meals’ at various fast food restaurants. Those places that the school buses stop when taking the kids on field trips or to/from sporting events. The places parents frequent when they’re in a hurry and need to ‘feed the kids something’ in between errands, lessons, practices, scrimmages, and the like. A number of these fast food chains such as Burger King, McDonalds, and Subway, are jumping on the healthy eating bandwagon and endeavoring to offer healthier menu options to kids. Besides cutting calories, new trends include offering apple slices, yogurt, and low-fat milk. Apples are certainly better for you and have fewer calories than fries, and although milk may have more calories, it adds important nutritional value. But don’t buy into the ads touting healthy fast food options for kids unless you plan to look closely before you order–especially if you let the kids ‘substitute’ cookies for the apple slices and soda for the milk! SUBWAY: Their kids menu includes a three-inch sandwich, apples, and milk. Healthiest: Veggie Delite with 345 calories. Unhealthiest, Roast Beef with 395 calories. BURGER KING: It’s the only chain on this list that extended its healthy choice options to its breakfast menu as well. Healthiest option: Chicken tenders, apple fries, and milk (350 calories). Unhealthiest is the hamburger, apple fries, and apple juice at 430 calories. Overall, their average kids meal has 414 calories. CHICK-FIL-A: Average kids meal calorie count is 441. The healthiest option is a single chicken strip, with milk and a fruit cup for 260 calories. The unhealthiest choice is chicken nuggets, low fat chocolate milk, and fries, at a whopping 660 calories. KENTUCKY FRIED CHICKEN: The KFC menu offers the largest number of items in their combos. Healthiest meal at 280 calories, are chicken strips, string cheese, corn, and a Capri Sun. Unhealthiest option is popcorn chicken, string cheese, potato wedges, and soda (663 calories). Overall, the average kids meal calorie count is 446. WENDY’S: The average calorie count for the kids meal options is 502 calories. The healthiest option is chicken nuggets, apples, and a soft drink (283 calories). The unhealthiest combo would be the chicken sandwich, fries, and soft drink at 623 calories. MCDONALDS: McDonalds recently announced a revamped kids menu. The average calories on their kids meal menu is 527. The healthiest choice with 380 calories is Chicken McNuggets, apple dippers, and apple juice. The highest calorie combo is a cheeseburger, fries, and chocolate milk, offered with 700 calories. SONIC: The average meal has 556 calories. The healthiest meal is chicken strips, apples, and juice for 410 calories. Or, for 740 calories, you can select the UNhealthiest meal combo, consisting of a grilled cheese, fries, and chocolate milk. Considering their kids menu has options like corn dogs and cheeseburgers, are you surprised to find that a basic grilled cheese sandwich ranks the highest in calories? Might be the thick Texas toast. Another note, is that their fries have more calories than their tater tots. QUIZNOS: Weighing in at an average 613 calories per kids meal, this popular sandwich shop offers toasted sandwiches, soft drink and a choice of either chips or a cookie. Based on that, their healthy choice: Ham melt sandwich, chips, and soda at 455 calories. Really! On the flip side, the Cheesy toasted sandwich, cookie, and soda combo offer a hefty 773 calories. DAIRY QUEEN: Known more for ice cream than lunch, it’s not surprising that they make the bottom of the list as far as a healthy kids menu. Their average kids meal contains 737 calories. The best possible combo is chicken strips, applesauce, soda, and an ice cream cone for 603 calories. Ouch! The worst? Cheeseburger, fries, soda, and a Dilly Bar with a scale-tipping 883. So the next time the kids ask you to turn the car into the local fast food joint because they’re hungry and you’re in a hurry…remember this! If you’re expecting a long day on the road, or have a jam packed agenda with the kids, why not plan ahead and pack a cooler with fruit, cheese, water bottles, protein bars, yogurt, and sandwiches, so you can avoid those unhealthy detours and still keep your schedule…and full tummies too! As recently reported in Natural News, Aspartame, (an artificial sweetener commercially known as Nutrasweet, Spoonful and Equal) has infiltrated the market. From soda and diet drinks to desserts and chewing gum, it offers a low-fat, low-calorie and no-sugar option enticing to diabetics and dieters. However, products containing aspartame have been shown to actually cause weight gain, and the components that make up aspartame have also been found to be toxic in themselves. So, why is it still considered safe for human consumption? Dr. Russell Blaylock, a respected neurosurgeon and author of an enlightening book called “Excitotoxins: The Taste that Kills,” speaks about excitotoxins and shares his thoughts on why he believes aspartame is dangerous. According to Dr. Blaylock, excitotoxins are substances that excite brain cells or neurons to the point of exhaustion and death. Normally, these substances act as transmitters, a substance allowing brain cells to relate with one another. However, these compounds are so harmful that the body keeps them in low concentrations. Anything that alters or increases these substances can cause neuro-degeneration, as well as degeneration of the spinal cord and the brain. Excitotoxins are normally found in plant substances, and, where most people are concerned, in food additives. Glutamate is one of the more commonly known excitotoxins. MSG is the sodium salt of glutamate. This amino acid is a normal neurotransmitter in the brain. In fact, it is the most commonly used neurotransmitter by the brain. So, you ask, “how could a substance that is used normally by the brain cause harm?” Because, glutamate, as a neurotransmitter, is used by the brain only in very, very small concentrations. When the concentration of this transmitter rises above this level the neurons begin to fire abnormally. At higher concentrations, the cells undergo cell death. Excitotoxins are found in almost all processed foods. In many cases they are being added in disguised forms, such as natural flavoring, spices, yeast extract, textured protein, soy protein extract, etc. Liquid forms of excitotoxins, such as those put into soups, gravies and diet soft drinks are more toxic than that added to solid foods. This is because they are more rapidly absorbed and reach higher blood levels. The brain has elaborate mechanisms to prevent accumulation of MSG in the brain. First is the blood-brain barrier, a system that impedes glutamate entry into the area of the brain cells. But, this system was intended to protect the brain against occasional elevation of glutamate of a moderate degree. It was NOT designed to eliminate very high concentrations of glutamate and aspartate consumed daily, or several times a day, as we see today. Several experiments have demonstrated that under such conditions, glutamate can by-pass this barrier system and enter the brain in toxic concentrations. In fact, there is some evidence that it may actually be concentrated within the brain with prolonged exposures. There are also several conditions under which the blood-brain barrier (BBB) is weak, instances under which excitotoxin food additives can enter and damage the brain. For example, before birth, the BBB is incompetent and will allow glutamate to enter the brain. It may be that for a considerable period after birth the barrier may also incompletely developed as well. Hypertension, diabetes, head trauma, brain tumors, strokes, certain drugs, Alzheimer’s disease, vitamin and mineral deficiencies, severe hypoglycemia, heat stroke, radiation, multiple sclerosis, and certain infections can all cause the barrier to fail. Plus, as we age, the barrier system becomes more porous, allowing excitotoxins in the blood to enter the brain. Finally, recent experiments have shown that glutamate and aspartate (as in aspartame) can actually OPEN the brain barrier itself. As Dr. Blaylock reports, “Since 1948 the amount of MSG added to foods has doubled every decade. By 1972, 262,000 metric tons were being added to foods. Over 800 million pounds of aspartame have been consumed in various products since it was first approved. Ironically, these food additives have nothing to do with preserving food or protecting its integrity. They are all used to alter the taste of food. MSG, hydrolyzed vegetable protein, and natural flavoring are used to enhance the taste of food so that it tastes better. A growing number of scientists and medical researchers over the past decade have accumulated mounds of evidence to support their belief that excitotoxins play a critical role in the development of several neurological disorders, including migraines, seizures, infections, certain endocrine disorders, specific types of obesity, and especially neurodegenerative diseases which include: ALS, Parkinson’s disease and Alzheimer’s. Despite the research and evidence however, the FDA does not recognize the immediate and long term health risks caused by excitotoxins being added to food, such as MSG, hydrolyzed vegetable protein, and aspartame (which is found in NutraSweet and Equal – the blue ‘fake sugar’ packets). One of the components of NutraSweet or aspartame is aspartic acid, a powerful excitotoxin similar to glutamate. Moreover, phenylalanine, one of its components, has been known to cause seizures. Dr. Blaylock goes on to add that what makes aspartame so dangerous is that it contains three neurotoxins: methanol, phenylalanine and aspartic acid. Methanol is a powerful neurotoxin whose exposure is carefully allowed by the EPA in miniscule levels in food. Nutrasweet, however, provides levels that are SEVEN TIMES the amount the EPA will allow anyone to use. It’s been known to produce blindness and cellular destruction in the brain and spinal cord, particularly the optic nerves. Aspartic acid is an excitotoxin that causes cell death in the brain and significantly affects neural developments in infants, resulting in behavioral changes and even hyperactivity in children. Phenylalanine, like aspartic acid, can also alter brain development during fetal formation and create a lowering of the seizure threshold. Phenylalanine and aspartic acid are both well-recognized neurotoxins and according to Dr. Blaylock, three neurotoxins in one mix are just unbelievable! Aspartame is found in over 6,000 products and consumed by 250 million people world wide. More reports of aspartame reactions have been reported to the FDA than all other food additives put together. Eighty percent of complaints to the FDA about food additives were aspartame related. After more than 8,000 complaints on the side effect of NutraSweet, the FDA released a list of 92 side effects associated with aspartame consumption. Destruction of kidney function – In a study conducted by scientists from Brigham and Women’s Hospital in Boston, it was discovered that subjects who drank more than two artificially sweetened beverages daily increased their risk of rapid kidney decline. Headaches/migraines – In a study published in Headache: The Journal of Head and Face Pain, it was discovered that ingestion of aspartame by those who suffer migraines caused a significant increase in headache frequency for some subjects. Increase of hunger and body weight – In an article published in the UT Health Science Center, it was revealed that diet soft drink consumption seemed much more related to the chances of becoming more overweight or obese. Increase of the risk of preterm delivery – In a study funded by the Center for Fetal Programming, Division of Epidemiology, a connection was discovered between the intake of artificially carbonated drinks and increased risk of preterm delivery. Seizures and Convulsions – As early as 1987, a study was already conducted by Timothy Maher and Richard J. Wurtman who, through their work, discovered that aspartame potentially induces seizures. Cancer – In a remarkably recent study conducted by the Ramazzini Institute, it was discovered that in rodents, aspartame was a carcinogenic agent in multiple sites with autopsies that showed a significant risk to lung and liver cancer. However, even in light of all these studies, the FDA has continued to declare that aspartame is safe for human consumption and daily use. Perhaps it’s about time we stop relying on the government to protect us, and come to our own conclusions about whether or not we wish to be guinea pigs, or if we wish to become part of the alarming health statistics reported in future medical research studies. Food irradiation refers to bombarding food with ionizing radiation to kill bacteria. Of course just as chemotherapy in humans sometimes destroys healthy cells along with cancerous ones, irradiation can destroy vitamins and minerals as they kill the living bacteria cells. For that reason some people feel stronger than others about buying and consuming irradiated foods. Since our Wildtree products are proudly said to have NO IRRADIATION, I did some research to decide on my personal position with respect to irradiation. As food is irradiated, (which can also be called electronic pasteurization, cold pasteurization, or pasteurization with xray), harmful cancer-causing chemical agents such as formaldehyde and benzene can be formed thru the chemical reactions that irradiation can cause. Irradiation damages the natural digestive enzymes found in raw foods. This means the body has to work harder to digest them. According to the Organic Consumer’s Association, irradiated foods can lose anywhere between 5% – 80% of many vitamins (A, C, E, K and B complex). The amount of loss depends on the dose of irradiation and the length of storage time. Most of the food in the American diet is already approved by the U.S. Food and Drug Administration (FDA) for irradiation: beef, pork, lamb, poultry, wheat, wheat flour, vegetables, fruits, shell eggs, seeds for sprouting, spices, herb teas. (Dairy is already pasteurized). Irradiation doesn’t kill all the bacteria in a food. In a few hours at room temperature, the bacteria remaining in meat or poultry after irradiation can multiply to the level existing before irradiation. Some bacteria, like the one that causes botulism, as well as viruses and prions (which are believed to cause Mad Cow Disease) are not killed by current doses of irradiation. Some opponents of irradiation believe that irradiation encourages food producers to cut corners on sanitation, because they can ‘clean up’ the food just before it is shipped. There is a difference between IRRADIATION and RADIOACTIVE. The technical term for irradiated food is “radiometric.” However, the effects that can come from eating irradiated foods can be the same type of effects from exposure to ionizing radiation. Meaning, although the food isn’t radioactive, eating it can give you an indirect exposure to radiation. Which, frankly, was enough for me to put irradiated foods on my personal “no thank you” list! From what I find, scientists haven’t published any significant long term studies showing the long term health effects from eating irradiated food, so it’s left up to us (as the consumer) to decide if we feel “no news is good news” with respect to health and safety. The Center for Disease Control (CDC) talks about the chemicals used to perform the irradiation process. Cobalt 60 is manufactured in a commercial nuclear reactor, by exposing non-radioactive cobalt to intense radiation in the reactor core. Cesium 137 is a by-product of the manufacturing of weapons-grade radioactive substances. Thus the supply of these two substances, like that of other radioactive materials used in medicine, science and industry, is dependent on the nuclear industry. Interestingly (and rather disconcertingly), the FDA does NOT require most irradiated foods to be labeled for the consumer. You should look for the Radura symbol (which logo should show a food that has been treated with ionizing radiation), or in the absence of the symbol, you may see the words “treated with ionizing radiation” or “irradiated to destroy harmful microbes.” However, from the FDA standpoint, the symbol, or the disclosure, is only enforced for labeling to the FIRST PURCHASER. Which in the case of processed foods, can mean a wholesaler or distributor, rather than an end consumer like us. Foods that are served in restaurants, schools, etc., or receive further processing, do not bear consumer labels. According to the CDC (Center for Disease Control), it is not required to label a food if a minor ingredient of the food, such as a spice, has been irradiated itself. According to the CDC, “Consumers are interested in a process that eliminates harmful microbes from the food and reduce the risk of foodborne disease. In test marketing of specific irradiated foods, consumers have shown that they are willing to buy them. Typically at least half will buy the irradiated food, if given a choice between irradiated product and the same product non-irradiated. If consumers are first educated about what irradiation is and why it is done, approximately 80% will buy the product in these marketing tests”. Good Source of Whole Grains: These items contain 8-15 grams of whole grains per serving (an “excellent” source has at least 16). However, even foods packed with whole grains can include preservatives, fat, sodium, sugar, and other “unhealthy” ingredients. The best sources of whole grains are brown rice, oatmeal, basic bran, quinoa, whole wheat pasta, and 100% whole wheat bread. Remember that the first three ingredients are the majority of the product’s content. Organic: All this means is that the item is grown or processed without pesticides or hormones. Organic desserts still contain the same calories as their ‘non organic’ counterparts. Organic pasta sauces can be loaded with sodium. USDA Organic requires 95% organic ingredients, but not 100! So, you can still find MSG, silicon dioxide (such as the packets that absorb moisture in your new shoes), and other unfriendly ingredients in USDA organic products. Remember, organic pertains to how it’s GROWN, but has NO correlation to health benefits! You still need to read the labels and check the sodium, sugar, and fat content. High fiber speeds up digestion and makes us feel full, but many contain powders like polydextrose and oat fiber. These are NOT the same fiber found naturally in fruits, veggies and whole grains. They can also upset a sensitive stomach or digestive system. most Bran Muffins have fiber, but also have a lot of sugar and saturated fat. Some of the oversized ones (such as bakery and coffee shop versions) can have 500 calories with 14 grams of fat. Sometimes a donut is the healthier choice! Diet Soda has artificial sweetners that actually make you crave MORE sweets & carbs. If you drink these in large quantities, it can actually cause you to GAIN weight. Instead, choose a seltzer or a naturally sweetened soda. Fortifed Water drinks have a few vitamins and minerals, but these drinks also have excess sugar/sweetners, and therefore extra calories. Eat fresh food for your vitamins, and drink regular water. If you want some flavor in it, opt for a fresh lemon, lime, or a mint leaf. Veggie Chips are still fried, so they likely are full of unhealthy fats and a good deal of sodium. Baked chips are still processed and result in empty calories. Instead, try natural popcorn and enjoy the fiber. You can make your own chips by slicing veggies super thin (a food processor can help), brush with some olive oil and spices, and bake at 350 until crisp (7-10 min). Granola can be full of sugar and high in calories (such as 16 grams of sugar and 600 calories for a bowl). Look for 10 grams of sugar or less. Use granola as a condiment – sprinkle sparingly, don’t eat in bulk. Granola bars, snack bars, and energy bars are guilty too! Jumbo Smoothies contain sugary juices and frozen yogurt, and may be as high as 600 calories! Far from a low-cal drink. Yogurt can also have excess sugar (some have 32 grams) per serving. Buy plain yogurt and add fresh fruit!